Oh my, how did February zoom by? It's almost March! 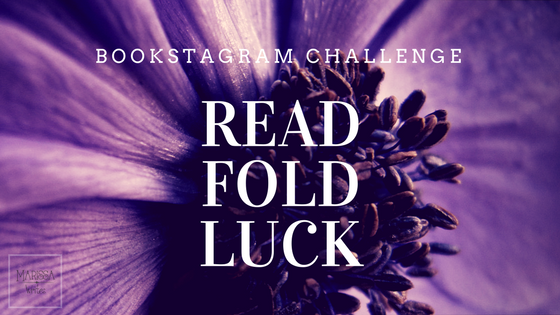 And that means, it's time for a new photo challenge on Instagram. And this one is especially for all of you bookstagramers out there. Did you follow along last month? If not, feel free to start now! Each day there is a different prompt, so you can join in the fun. Some times, like last month, we have paper folding prompts. The links can be found below, feel free to do them, or interrupt them in way you want! But, we also decided to change things up a bit this month. First of all, we have two new co-hosts!! Yay! And, because there are a ton of great monthly challenges out there, we wanted to make it easier to mesh this with others, so most days the prompt is just a Question of the Day (QOTD). Just answer the question! Feel free to feature your answers through books, but this should also help you all to fit this super fun challenge into your month. International Pancake day: Book & Breakfast: Folding Prompt: create your own cup, or maybe create your whole breakfast?? Sock Sunday: QOTD: Do you paint your toenails? Or ignore them completely? Middle Name Day: QOTD: What is your middle name? How about find a book with a character who has three names?? QOTD: Would you rather own only hardback or paperback books? Panic Day: QOTD: What makes you panic? Do you panic over losing books? #ShelfieSaturday – add in any of the previous paper folding projects you’ve done! Arbor Day – Folding Prompt: fold a paper tree, use old books pages, or newspaper pages to create one of these lovely flowers and you know, "save a tree"
Pi day: Folding Prompt: try this little paper Pi and while your at it... QOTD: What are your thoughts on math? Are you a math person? Inflated Ego: QOTD: Which character with an over-inflated ego would you spend a week with on a deserted island? Book Spiral: QOTD: Would you rather only read during the day or during the night? 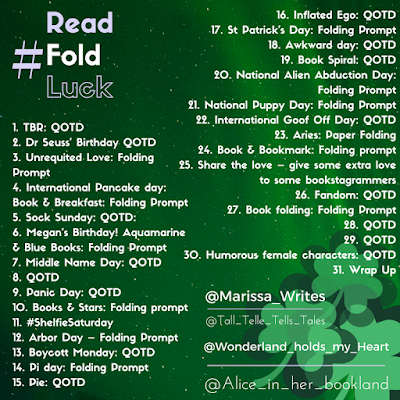 National Alien Abduction Day: Folding Prompt: Create this adorably odd Alien, and share some space-like books! Fandom: show your favorite fandom…any fandom at all will do! QOTD: What is your favorite Fandom, and why? QOTD: What is your all-time favorite author? Which book?? If you are looking for some extra ideas, or an easier option, or more details, feel free to stop by my pinterest board... or search for your own! There are so many great paper folding projects around, feel free to add to any of the prompts you want! Share this on Twitter with your followers! 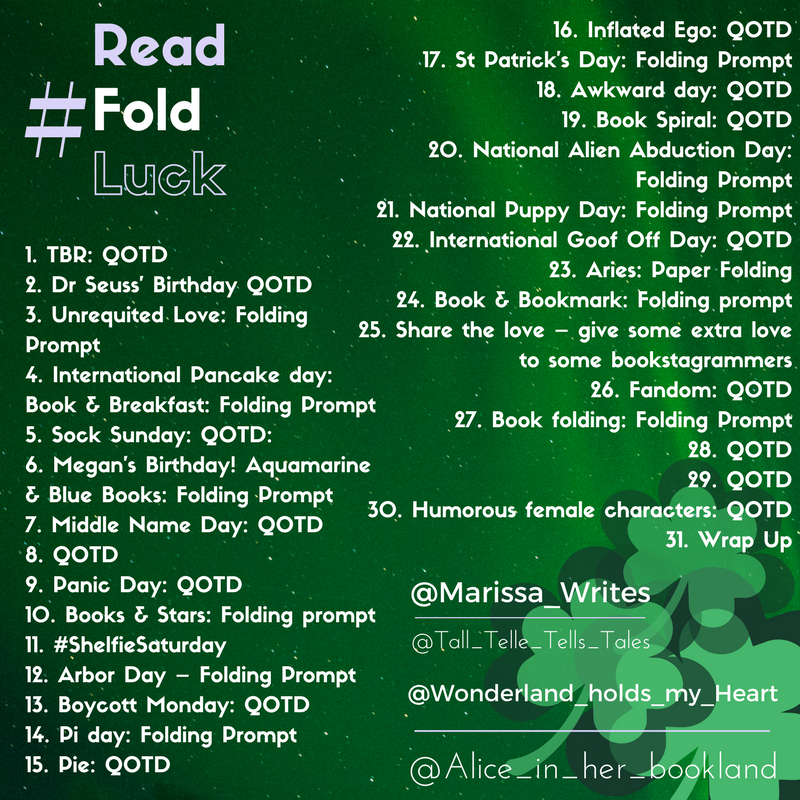 I know that the folding prompts can be intimidating, so feel free to ask me any questions you want! But I really hope I see your attempts on Instagram... I'll be trying as many as I can, too! Oh, and if we get enough questions, we will live stream tutorials on the folding prompts too, so make sure you are following all of us to get updates throughout the month.